Michael and Judy McMahon are stalwarts of the Sydney restaurant scene and their harbourside eatery Catalina in Rose Bay is right at the top of the very best spots for a bite to eat in the Eastern Suburbs. It even has it's own tame pelicans to charm diners and next door is the base for the quaint flying boats that deliver passengers to ritzy Palm Beach. 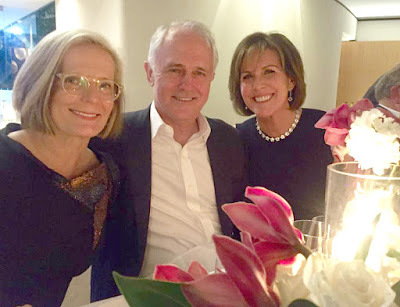 Judy has just turned 60 so that's as good a reason as any to hold a shindig so she gathered some old pals at Catalina for lunch which included our esteemed Prime Minister Malcolm Turnbull and his lovely wife Lucy as our snap shows with birthday girl Judy. And the menu? : glazed Toothfish and braised octopus with couscous to start with followed by roast lamb with roasted baby beetroots washed down with Pommery Rosé Champagne. We reckon Malcolm needed a spot of relaxation. For Tuesday & The Census was just around the corner.